for the passenger, truck and OE service provider. With over thirty sales representatives covering 13 states, averaging twelve years of experience we can help you solve your service needs. Orders ship from one of our four warehouses encompassing a total of 40,000 square feet. 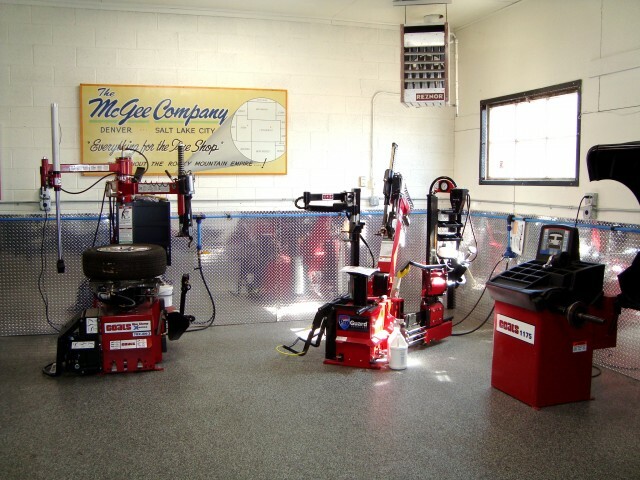 McGee Company offers same day shipping on most orders with a 97% fill rate on tire supply products. What separates our tire supply and equipment programs from the competition? Customer service-We pride ourselves on getting the right solution for every customer’s needs with fast turnaround on products and responses to customers. Family owned & operated- The third generation of McGee’s are taking care of daily operations and the extended family of over 100 employees! Customer training – TPMS, Proper Tire Repair, safe wheel installation , Equipment maintenance, TIA Truck Tire Service Certification, & Tool maintenance. Dallas and Denver interactive equipment showrooms. In-house leasing – Flexible payment plans. Quality Products – Knowledgeable staff with a variety of USA made and imports available for automotive service equipment & supplies. Project Coordination – single point of contact to coordinate new service facility equipment installation. Tailored solutions- For the mom & pop up to the largest dealership. Continuous employee training about the industry and products. Involved in most states tire associations and networks. Longevity – delivering superior experience since 1951! We can help you with a detailed equipment layout! For 65 plus years, one goal has never changed—our commitment to customers!